Phở Hưng is just a classic, low-key Vietnamese restaurant with a very cafeteria/cheap diner-esque feel. Many of the servers barely acknowledge your presence, and I’ve NEVER had a good experience with asking questions, requesting menu modifications, or lodging concerns about the slowness of the food (it’s not usually slow, but if it is you should probably just grin and bear it– your complaint will only make your server annoyed with you).There are 2 locations in Toronto and one in Missasauga. My home base is the Bloor Street location, which is up a couple flights of stairs in a largely unattractive room with hand-written menu items posted haphazardly on the walls. All of this being said, I love the food. It’s just authentic. And yummy. And that’s all I really care about in this case. The “phở” in Phở Hưng is the name of a noodle soup, often with beef (or, in the case of this restaurant, almost exclusively with beef, sometimes sliced thinly and put into the soup raw). This is one of the go-to items on the Phở Hưng menu, and definitely worth a try (their other soups are good too). My other tried-and-true favourite is the “bún” dishes (see this recipe for a little more background on bún). At Phở Hưng you can get a number of varieties of bún, which come to you as bowls of vermicelli noodles on top of bean sprouts and iceberg lettuce, topped with your choice of meat (and if you choose carefully, a delicious deep fried Vietnamese spring roll). You top the whole thing off with fish sauce (that they usually provide) and/or some hot chili sauce and hoisin sauce (which you almost certainly have to go hunting for around the diner) ((I mean it- scout out a table that has it and ask for theirs)). I’ve tried a couple other things on the menu, and they’ve all been good. If you’re a pickier eater, you can ask your server what exactly is involved in some of the dishes, ask a friend, or take a look at the menu on their website (some of the items are pictured). Good choices for less adventurous palates are the Shrimp Fresh Rolls, the Deep Fried Vietnamese Spring Roll (not quite like your typical Chinese spring roll, so don’t expect this) and Vermicelli Platters where you basically get to make your own rolls (e.g. P-36, which features sugarcane shrimp). Overall, Pho Hung is an experience. Hopefully you enjoy it as much as I do (or you stay away if the service issue is not for you!). 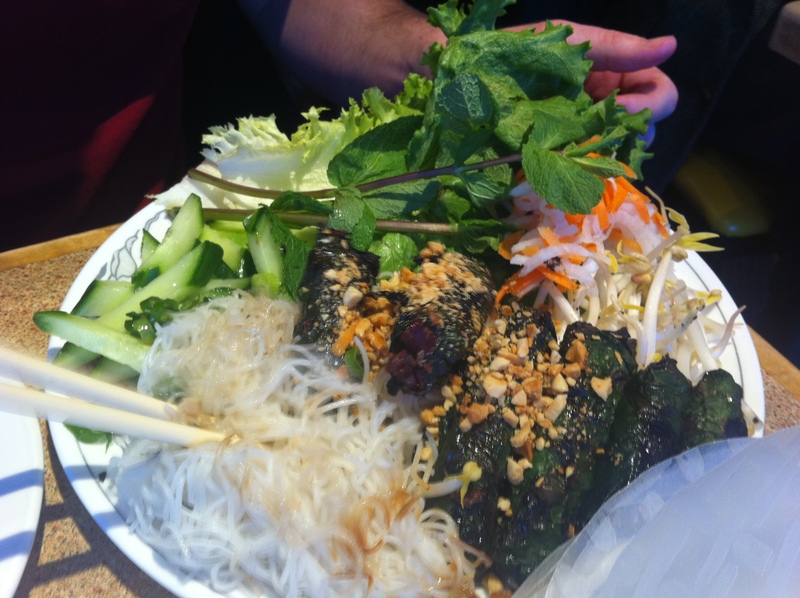 This entry was posted in Dine Under $50, Recommended, Viet/Thai and tagged fresh rolls, pho, spring rolls, vermicelli bowls. Bookmark the permalink.